Sherica Hymes is a Management Consultant with F&H Solutions Group. Sherica Hymes is a proud partner of F&H Solutions Group. 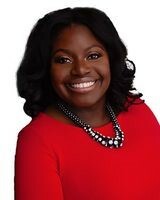 She is the Founder & CEO of Polished Consulting LLC and the Total Woman Summit. As an experienced consultant, facilitator and coach she specializes in providing targeted solutions that equips leaders to engage, empower and motivate their people. Sherica has more than 20 years of strategic organizational design, leadership, change management and training and development experience. Her career spans across multiple industries ranging from technology to manufacturing/distribution to sales, to financial services to music entertainment. Sherica partners with her clients to customize strategies and deliver participant-centered training to increase capabilities, reduce inefficiencies, increase productivity, strengthen leadership and frontline employee relationships, increase engagement, ultimately driving for positive organizational output. She focuses on designing and delivering solutions that sharpens the following competencies: leadership development, change management, career coaching, team building, performance management, succession planning, and diversity and inclusion. In addition to training, Sherica has delivered numerous workshops to more than 25,000 trainers and leaders worldwide facilitates workshops on team building, change management, unconscious and conscious bias, emotional intelligence, servant leadership and coaching for success. Prior to founding Polished Consulting, LLC, Sherica worked for various Fortune 500 companies such as Comcast NBC Universal, Raymond James Financial, SAIC, Jam Industries, Accredo Health and more. As a professional and motivational speaker, she captivates audiences with her unique style of storytelling, infusing both wit and humor. In her free time, Sherica is deeply engaged in her Memphis community. Her philanthropic efforts include increasing engagement, raising thousands of dollars for non-profits she feels passionate about and advocating for the most vulnerable in community. She faithfully dedicates her time to various public initiatives and charities in the city. Sherica currently serves on the Agape Executive Board of Directors as the Personnel Chair, New Memphis Institute Fellows Advisory Board as Sustainability Chair, United Way Women United as the Special Events Co-Chair and The National Civil Rights Museum- Night at the Lorraine Planning Committee. Her greatest role and title is, Mom! Sherica is a certified HR Practitioner through the HR Certification Institute (HRCI), Society of Human Resources Management (SHRM), a certified Change Practitioner through PROSCI, a certified Facilitator through Development Dimensions Institute (DDI). Her company, Polished Consulting, LLC is a proud Women-Owned Certified MBE, DBE, LOSB and SBE.